One of the joys of watercolor is the ease of cleanup. In fact, you don’t really have to clean up at all, if you don’t feel like it. Nothing terrible happens if you just wipe off your brush, put it down and walk away. Well, mostly—do you know the right way to put down a watercolor brush to keep it in good condition for as long as possible? If not, keep reading. This article is about acrylic cleanup, but I will also share something you might not know about preserving your watercolor brushes, plus a couple of other tips and products watercolorists might also find useful. To be honest, for a long time, the hassle of cleanup often discouraged me from using acrylics. Have you ever been there? It’s so much fun, but . . . the mess! What do you do about stains and spills on your table? Your clothes? Your floor? Your palette? Your hands? Maybe all that stuff doesn’t bother you, but what about your good brushes? Would it surprise you to know that I now use my best watercolor brushes to paint in acrylic with no worries at all? 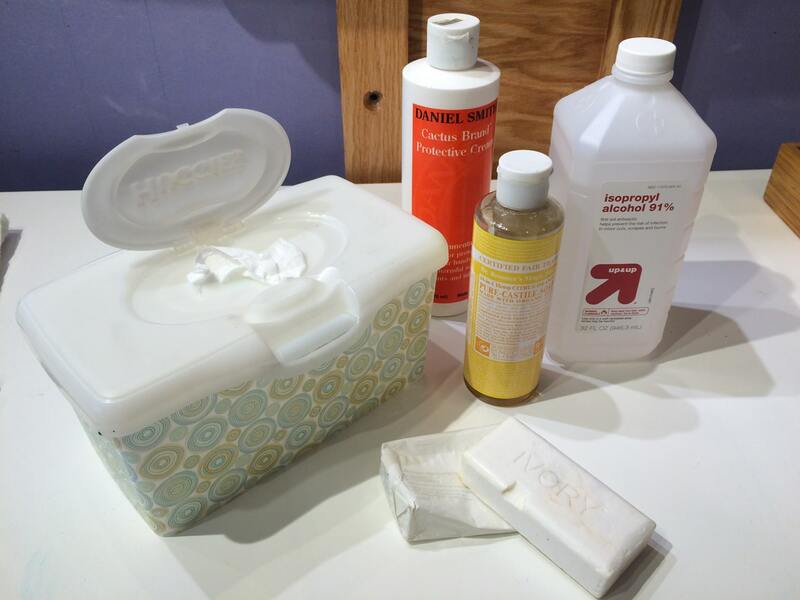 My acrylic cleanup arsenal: barrier cream, baby wipes, rubbing alcohol, castile soap and Ivory bar soap. If I am planning to really get my hands in the paint, I wear nitrile gloves (pretty cheap if you buy them in boxes of 100 in the paint department of home improvement stores. But I really don’t like to wear them, and I’m also really good at tearing holes in them without noticing, so I prefer to use a barrier cream. Barrier creams, sold in art supply stores and paint stores, are designed to protect you from absorbing harmful stuff through your skin. I have no information about how accurate that claim is, but I can tell you that using a barrier cream will make it a lot easier to remove dried paint (of all sorts) from your hands. This one is completely non-greasy, absorbs quickly and has a pleasant smell. So nice I use it as my general-purpose hand lotion all winter. Best thing ever for taking acrylic paint off your hands (and your table, too, if you like). Unlike rubbing alcohol, or scrubbing with pumice cleansers, baby wipes won’t dry out your skin. Added bonus: the pop-up containers make it easy to grab one without getting paint all over everything else. My favorite is Huggies Cucumber and Green Tea for the mild, unobtrusive scent. This is too harsh for me to want to use it on my hands, but it works well for removing dried acrylic from hard surfaces like your painting table, your plastic palette or vinyl or wood floors. Acrylic paint cures and hardens over time, so you’ll have an easier time removing it in the first day or two. It’s always smart to wear an apron or painting shirt when working with acrylics. But I have been known to go into my studio for “just a minute” to get a pencil or something and not emerge for several hours. I’m not sure how it happens, but it does not generally include putting on an apron. This is why all my favorite white shirts eventually wind up with paint on the cuffs. As soon as you notice, soak the spot with rubbing alcohol, let it sit for a bit and then scrub the spot with a toothbrush. This will usually remove most of the acrylic medium, but not necessarily all the color. For that, turn to . . . This also works on staining watercolors, like phthalo green and blue, and the quinacridone colors. I use it to pre-treat stains on clothing before washing, and to remove stains from plastic palettes. This is what I use to clean my brushes, including brushes with dried-on acrylic paint. One of the annoying things about acrylic is how a brush that looks and feels clean can actually still have enough acrylic medium in it that you come back the next day and find it hard and crusty. Castile soap to the rescue! (You can buy this at Target, by the way, plus many natural food stores.) Work some castile soap into the brush, as best you can, and leave it overnight. Unless it was totally encrusted, you will usually be able to remove the dried-in acrylic the next morning. If there was a lot of paint still in the brush (say, if you forgot to wash it at all), you might have to repeat this process several times to dissolve all the layers of gunk, but eventually, you’ll get it all out of the brush. Needless to say, the more gunk you close to or inside the ferrule (the metal “collar” at the top of the bristles), the longer it will take to clean the brush, simply because it’s harder to work the soap into the bristles there. Don’t struggle with it. Just remove as much as will rinse out fairly easily and work in some fresh soap and let it sit overnight again. And, for the last tip . . .
6. The right way to dry and store your watercolor (and acrylic) brushes. Do you store your watercolor brushes standing upright in a jar? It looks so pretty, and it’s so handy—you can easily grab the brush you need. And that’s what you see in all the pictures, right? There’s something they don’t often tell you, though—you only want to store a brush like that after it’s totally dry! Otherwise, whatever is in the brush seeps down into the ferrule. Even a thin layer of gunk in the ferrule gradually prevents the brush hairs from laying as tightly against each other and the brush will no longer form a nice sharp point. So, do your brushes a favor and store them tip down until they are completely dry (including time for any moisture to move out of the ferrule). You can buy or make a brush washer that has clips to hold the brushes tip down, but it works just as well to simply place them on a towel on a slanted surface. I have a scrap of plexiglas propped up with a block of wood with a shop towel on top of it. It’s that simple! Not only will you preserve your brushes, but if there is anything that crept up inside the ferrule while you worked, it will have a chance to work its way back out. Of course, you don’t want to ever leave a watercolor brush standing in water! If you’re working in fast-drying acrylic, and feel you really need to leave your brushes in water so the paint doesn’t dry in the bristles, put just a small amount of water in your water container so that just the bristles of the brush are in the water. If you must leave a brush in water to prevent acrylic paint from drying in it while you work with another brush, leave it in water that just covers the bristles and NOT the ferrule. Better yet, simply rinse the brush, don’t shake or wipe it dry, and leave it resting tip down. Unless you leave it for hours, this will be enough to keep the paint from drying in the brush until you can pause to wash it. Wet the brush and leave it resting tip down. I know most people use a brush rest to keep the tip of the brush up, but this way is much better for the brush. I use a towel or piece of freezer paper to protect my table. If you know you won’t be able to get around to washing the brush before the paint dries in it, no problem! Simply saturate the bristles with castile soap and leave it resting flat or tip down until you do have time to wash it. So, there you have it. Now you, too, can fearlessly explore the fun of acrylic, with no worries about cleanup or ruining brushes!